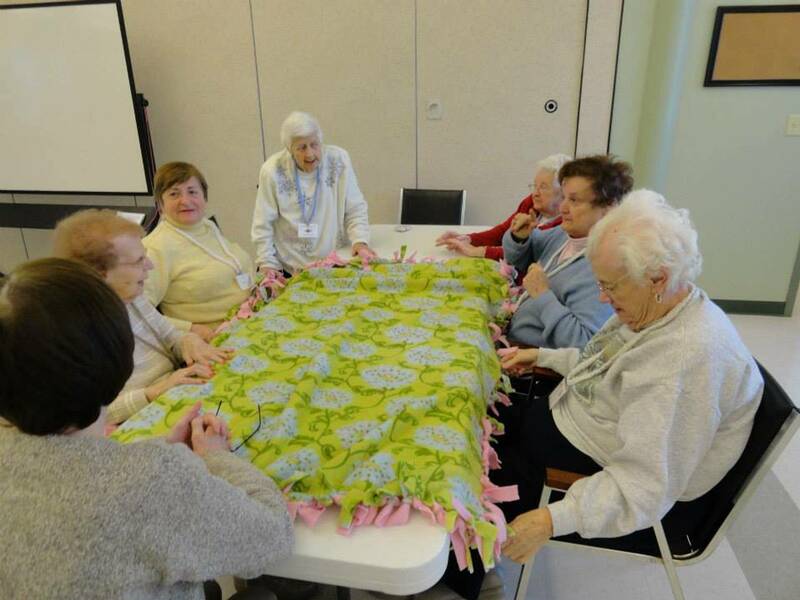 The ladies in our program spend the afternoon making a No Sew blanket. A lottery of all who participated will reveal the luck winner who gets to take home this warm and comfy blanket. Second grade students from Hoyle School visit our Supportive Day Program during the holiday season. Here, they entertain us with Christmas Carols. 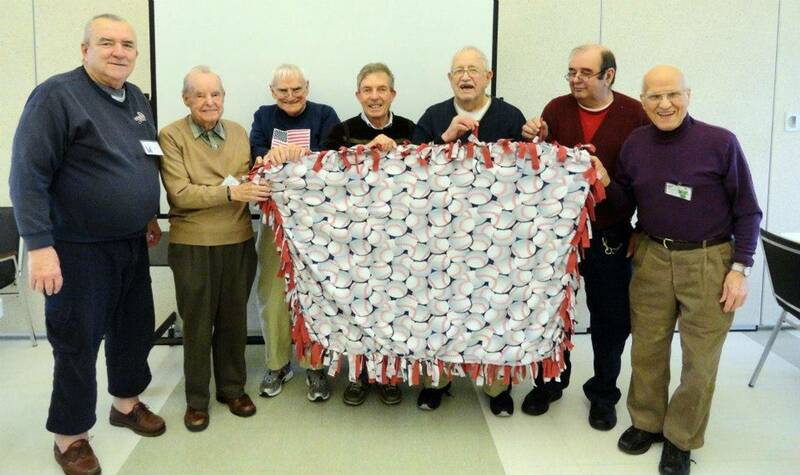 Our men's group created their very own No Sew Blanket of Baseballs. Friendships form rather quickly and sometimes a little catching up with one another is in order. A little competition can be healthy. 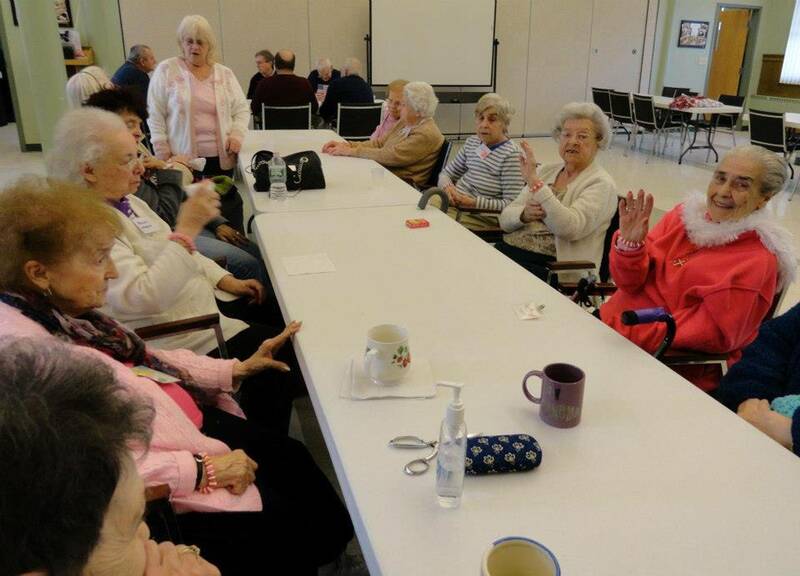 A variety of floor games such as bean bag toss and indoor "lawn" darts bring lots of fun to our afternoons. Whenever the Hoyle School students visit something special happens. Whether it's reading a story, taking part in an arts and crafts project or exercising together, a great time is had by all. 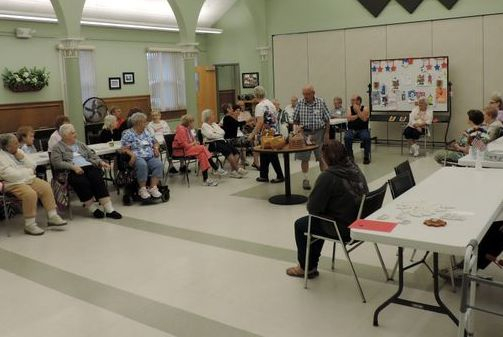 Here at the Swansea Council on Aging we are extremely proud of our Supportive Day Program. We understand how difficult it may be for caregivers who live with the challenges and struggles of caring for their loved one. 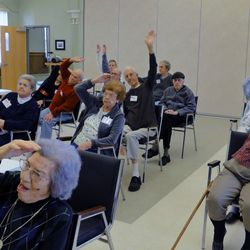 We also understand how important it is for seniors to maintain their independence and dignity as they age. Caregivers and seniors are entitled to a quality of life that we have all come to appreciate. Staff members at the Council on Aging are compassionate and dedicated individuals who are here to help! 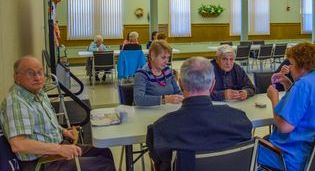 Adults 60 or older who need supervision during the day (to allow them to continue to live at home) can find the help they need at Swansea Council on Aging's Supportive Day Program. Our program also provides respite for caregivers who desperately need assistance, but who often times, don't know where to turn. Each day a variety of activities, programs and games are offered. 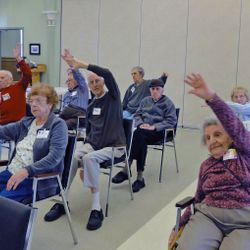 Gentle exercise therapy is offered daily and all are encouraged to participate. Entertainment and guest speakers are planned monthly. Upon arrival, a light breakfast is served. Individuals are urged to engage in socialization sessions where they can enjoy friendly discussions with their peers. A nutritious lunch is served daily. For special events and/or parties, catered meals are offered from time to time. Snacks are also provided daily. This very special program is offered Tuesday through Friday from 8 AM to 3 PM. If you're not sure whether this program meets your individual needs, please call and ask about our Supportive Day "Free Trial" Gift Card. This will entitle you to a one-day pass (prior notice is required). We hope you will take advantage of this very special offer. Give us this opportunity to help you and your loved. You won't regret it! CLICK HERE FOR MORE INFORMATION ABOUT OUR PROGRAM! The 2016 Summer Olympics Done Our Way! With all the excitement of the Summer Olympics, our Supportive Daycare Coordinator, Cristina Camarao thought, why should those athletes have all the fun? With that one thought, she brought the Olympics games from Rio to Swansea - Let the games begin! Our seniors and staff participated in Ladder Toss, Bean Bag Toss, the Javelin (pool noodle) Throw and (beach ball) Basketball. Team Canada took the Gold but to see all the results and the fun, you'll have to CLICK ON THIS LINK! Our "Show and Tell" continues to be a hit! 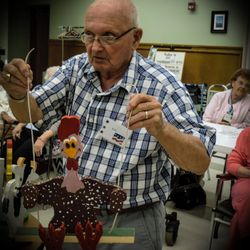 We continue to be amazed by all of the talented and gifted individuals at our center. 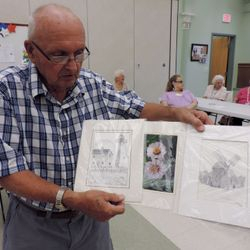 Former participants showed off a beautiful fleece blanket while another brought in photos of spectacular frames she creates herself as a hobby. 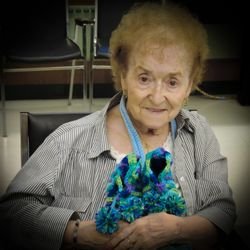 Another showed off a gorgeous navy blue sweater she was still in the process of making. Other individuals brought in family photos of adorable grandchildren and even one of himself when he served as Grand Marshall in the Swansea Parade. 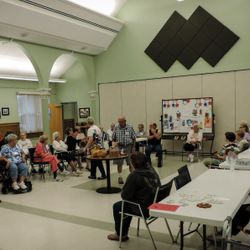 Staff members also brought in some of their treasured possessions including cultural figurines from Arizona, a bust of President John F. Kennedy from Washington, DC and a homemade wooden stool which cradled children and grandchildren. 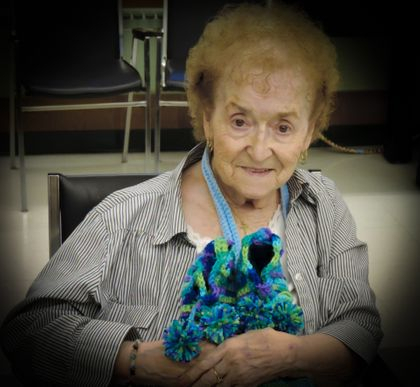 Another memorable moment was a Teddy Bear whose outer lining was crafted from a shirt once worn by a loved one. There were many laughs, a few tears and LOTS of fun. Today brought additional talents of knitted slippers, a personalized calendar, wood work masterpieces (bird houses etc.) and beautiful hand drawn and colored art work. We thank all who shared their memories and talents with us and hope you enjoy watching the slideshow below to see these talented individuals yourself. Spider Pops and Witch Hat Cookies - Yum!! The Gang's All Here - Happy Holidays! In the video below you will see our staff welcome the day's participants. Our friends will then enjoy a light breakfast, enjoy some socialization and catch up on some news. You will also witness our morning excercise and lunch program, followed by the afternoon snack consisting of a heart-shaped cupcake. Each client was able to decorate their own treat and enjoy its yummy flavors! 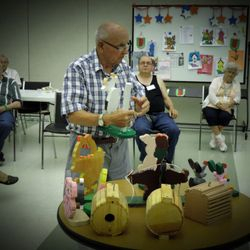 You will see our talented "Show and Tell" participants. Be sure to watch until the very end so you can catch a quick glimpse of our Valentine's Day entertainment enjoyed by all -- especially our very own dancers! !